Myxobacteria are amongst the top producers of natural products. The diversity and unique structural properties of their secondary metabolites is what make these social microbes highly attractive for drug discovery. Screening of products derived from these bacteria has revealed a puzzling amount of hits against infectious and non-infectious human diseases. Preying mainly on other bacteria and fungi, why would these ancient hunters manufacture compounds beneficial for us? The answer may be the targeting of shared processes and structural features conserved throughout evolution. Natural products from plants and microbes have played a pivotal role in drug discovery for more than a century [1–3]. In recent years, myxobacteria have matched fungi, actinomycetes as well as some species of the genus Bacillus as top producers of microbial secondary metabolites [4–6]. More importantly, screening campaigns have revealed a large proportion of the myxobacteria secondary metabolism to have activities against human diseases such as cancer, bacterial and viral infections [6–8]. Myxobacteria are a group of proteobacteria which reside mainly in soil [9, 10]. These social microbes move by an axonal cellular motion called gliding [11, 12], and although cells grow independently, they form collective swarms to prey and generate transient structures, called fruiting bodies (Figure 1), when resources are scarce . During cooperative feeding, individual cells organize in waves which travel in a rippling-like motion [12, 14]. As waves of cells collide, they aggregate in mounds that grow in size forming fruiting bodies that can harbor about 105 individuals. Cells within these structures become myxospores. Sporulation is triggered by signaling at the cell-cell contact surface when nutrients are available, and the myxospores germinate to eventually develop new swarms . To control these processes, myxobacteria have evolved a unique mechanism of extracellular and intracellular signals, including diverse proteins and small metabolites . 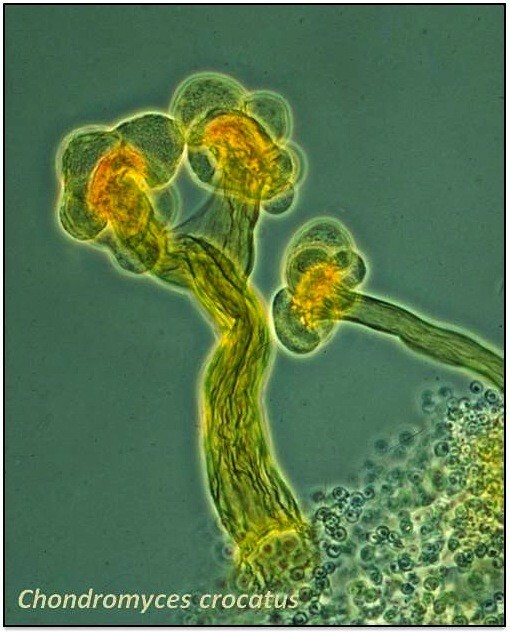 Image of fruiting bodies from the myxobacterium Chondromyces crocatus (courtesy of Hans Reichenbach). The chemical space of the myxobacteria metabolome is rare both in diversity and biological activities [5, 16, 17]. Their secondary metabolites present structural elements not commonly produced by other microbes such as unusual hybrids of polyketides and non-ribosomally made peptides [5, 18]. In fact, around 40% of the described myxobacterial compounds represent novel chemical structures . Furthermore, most small molecules from myxobacteria are not glycosylated as opposed to products derived from actinomycetes  and they target molecules that are often not targeted by metabolites from other microbes. Examples include inhibitors of mitochondrial respiration and eukaryotic protein synthesis, carboxylase and polymerase inhibitors and molecules that affect microtubule assembly . Although the reasons why myxobacteria display such a large array of secondary metabolites are still not well understood, it has been argued that they confer a competitive advantage in the soil environment and are used to modulate cell-cell interactions within the population , to protect ecological niches in their competitive environment , and used as weapons for predation . This level of chemical complexity requires an equally complex regulatory network to function, altogether enhancing the survival and competitivity of both the individual and the population . This is reflected in the genetic space employed by myxobacteria for their secondary metabolism. One of the largest bacterial genome reported to date belongs to the myxobacterium Sorangium cellulosum with around 20 secondary metabolite loci and probably more to be discovered . Another well studied myxobacterium, Myxococcus xanthus, has around 18 secondary metabolite gene clusters accounting for around 9% of its genome  which is more than some species of actinomycetes with around 6% of genome coverage for secondary metabolite loci [22, 23]. Given this large space on the level of the genome, the known diversity between different myxobacteria and the vast number of different bacterial strains available in various collections, there seems to be an immense room for exploration and exploitation. The amount of different small molecules from myxobacteria targeting other soil bacteria and fungi, around 29% and 54% respectively, and their higher production rates during exponential growth seems to reinforce the idea of a broad use of secondary metabolites for hunting [13, 17]. Any predatory microorganism would benefit greatly from such a diverse armament but why would a large amount of these metabolites be active against human diseases and pathogens? An attractive explanation is that many of these products target shared processes or structural features conserved throughout evolution [24–26]. For example, the LSm1-7 protein complex in mammalian cells was shown to be required for efficient hepatitis C virus (HCV) translation and replication . The Brome mosaic virus (BMV), a plant virus that can replicate in yeast, utilizes the respective yeast homologues for the same processes [27–29]. Likewise, the bacteriophage Q, a plus-strand RNA virus as HCV and BMV, requires Hfq, the homologue of LSm1 in bacteria for its expansion . Thus there is a functional conservation of cellular and viral regulatory elements across kingdoms and virus groups that may be exploited for antiviral drug development. Indeed, a recent screen against processing body proteins that include the LSm1-7 complex revealed several hits from a myxobacterial metabolite library that overlapped with antiviral activities (Martinez et al., unpublished). To learn more about the bioactivity profile of these potent compounds, systematic testing in a broad panel of bioassays as offered by e.g. academic consortia such as EU-OPENSCREEN would be strategically worthwhile. However, to develop a metabolite hit into an applicable pharmaceutical compound is not an easy task, especially given the complexity of their natural product chemistry, side effects and poor bioavailability. Therefore, to make better use of natures pharmaceutical factories, new technologies such as engineering of microorganisms to synthesize complex molecular structures, in silico tools to predict the target profile and anticipate potential side effects of those metabolites, and targeted delivery strategies for example via nanoparticles are under the spotlight and will play an increasing role in the future [31–35]. The authors of this article are supported by grants from the Spanish Ministry of Science and Innovation BFU2010-20803 to JD, SAF2010-21336 to AM, BIO2011-26669 to JM and the Spanish Instituto de Salud Carlos III. The EU-OPENSCREEN preparatory phase project receives funding from the European Union Seventh Framework Programme (FP7/2007-2013) under grant agreement n 261861.